Trussell Trust | Ipswich Unemployed Action. Food Bank Need Rockets as Universal Credit Hits Benefit Claimants. Food bank charity gives record level of supplies. The biggest network of food banks in the UK says it provided record levels of “emergency food supplies” last year. The annual figures from the Trussell Trust charity show a 13% increase, providing 1.3 million three-day food packages for “people in crisis”. It warns the increase has been driven by those on benefits not being able to afford basic essentials. At this point the Mirror helpfully points this out. Benefit delays accounted for 24% of the network’s referrals in 2017-18, with benefit changes cited in 18% of cases. 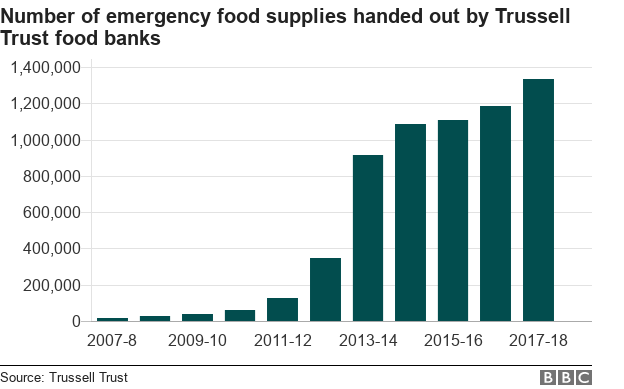 Between 1st April 2017 and 31st March 2018, The Trussell Trust’s foodbank network distributed 1,332,952 three day emergency food supplies to people in crisis, a 13% increase on the previous year. 484,026 of these went to children. This is a higher increase than the previous financial year, when foodbank use was up by 6.64%. For the first time, new national data highlights the growing proportion of foodbank referrals due to benefit levels not covering the costs of essentials, driving the increase in foodbank use overall. ‘Low income – benefits, not earning’ is the biggest single, and fastest growing, reason for referral to a foodbank, with ‘low income’ accounting for 28% of referrals UK-wide compared to 26% in the previous year. Analysis of trends over time demonstrates it has significantly increased since April 2016, suggesting an urgent need to look at the adequacy of current benefit levels. Debt accounted for an increasing percentage of referrals – 9% up from 8% of referrals in the past year – and the statistics show the essential costs of housing and utility bills are increasingly driving foodbank referrals for this reason, with the proportion of referrals due to housing debt and utility bill debt increasing significantly since April 2016. The other main primary referral reasons in 2017-18 were benefit delays (24%) and benefit changes (18%). New data about the types of benefit change driving foodbank use is clear: whilst referrals due to ‘benefit sanction’ have declined over the last year, those due to ‘reduction in benefit value’ have the fastest growth rate of all referrals made due to a benefit change, and those due to ‘moving to a different benefit’ have also grown significantly. The release of the figures is accompanied by the publication of Left Behind: Is Universal Credit Truly Universal? , a new report into Universal Credit and foodbank use published today. The findings, from a survey of 284 people on UC referred to foodbanks, show the adverse impact of the initial wait, the lack of available statutory support, the inability of UC payments to cover the cost of living for people who most need it, and poor administration. The charity is consequently calling for benefit levels to be uprated in line with inflation to ensure payments keep pace with the cost of living, particularly for disabled people and families with dependent children who are particularly at risk of needing a foodbank, and for a requirement to be placed upon Local Authorities to deliver a true Universal Support service to everyone who starts a Universal Credit claim. It is also asking for an urgent inquiry into poor administration within Universal Credit, so errors such as incorrect payments along with poor communication issues can be tackled. Unemployed to Get Food Vouchers for Christian Charity Dole-Out. Job centres around Britain are to give food vouchers to people experiencing severe financial hardship. The vouchers, which can be redeemed at foodbanks run by the Trussell Trust charity, will be handed out by staff at Jobcentre Plus (JCP) branches. One voucher can be exchanged for three days’ worth of food. The scheme will be piloted in Salisbury and Gloucester from 4 January, before expanding across England, Wales and Scotland in April. It will run in Jobcentre Plus branches that have a foodbank in the surrounding area. The Trussell Trust already has 78 foodbanks around the country and anticipates that there will be 86 foodbanks by April 2011. Severe hardship. The move comes after lengthy negotiations between the trust and the Department for Work and Pensions (DWP). The charity sent a report to the Secretary of State for Work and Pensions, Iain Duncan Smith, in the summer. A person experiencing severe financial hardship, caused by issues such as benefit delays or being ineligible for a JCP crisis loan, will be given a voucher that can be exchanged at a trust foodbank for three days’ worth of food. An individual can be given three vouchers in a row during one particular period of hardship, and can be helped three times in a year, meaning a total of nine vouchers a year can be given out per person. About 41,000 people were fed by 44 foodbanks across the UK last year The Trussell Trust is a Christian charity and its staff and volunteers arrange collections of food. They ask supermarket shoppers in each foodbank area to donate an extra item from a predefined shopping list – then distribute the goods by means of vouchers. The vouchers are distributed by “statutory professionals” such as doctors, health workers, social workers, the Citizens’ Advice Bureau and probation officers among others. Some 41,000 people were fed by 44 foodbanks last year, and the trust estimates that 35-40% of them had problems with benefits. When the first foodbanks were set up in 2000 in Salisbury, employees of the local JCP were initially one of the main distributors of foodbank vouchers. When the charity’s foodbank franchise scheme rolled out around the country in 2004, other JCPs also began to adopt the process. Chris Mould Trussell Trust director But the trust says it is “simply not true that all those entitled to benefits receive them on the day”. On behalf of the trust, MP Andrew Selous asked a series of parliamentary questions in 2009 and 2010 about benefit delay. The eventual response given in January 2010 stated that 37,046 people waited 17 days or more for their jobseeker’s allowance, of which 20,068 waited 22 days or more. Some might ask why the state should rely on a group with a religious-agenda to plug the gaps in its public services. One might ask if other religious groups will feel entitled to do the same.